After a weekend’s break, the 2018 FIM Motocross World Championship fires back into life with round 12 of the series – the MXGP of Indonesia – at Pangkal Pinang. The big news is – of course – that Jeffrey Herlings (Red Bull KTM) will be back in the saddle two-and-a-half weeks after breaking his collarbone and three ribs in a training crash. He won’t be fit and he will be in pain but the Dutchman is as tough as they come – he raced the final GP of 2015 with a still-broken femur in a brave but ultimately fruitless attempt to defend his MX2 title. Having watched helplessly as his team-mate and defending champion Tony Cairoli took 50 points out of his series lead last time out in Lombardia, Herlings’ advantage is just 12 points. If he can come out of Pangkal Pinang still holding the red series leader’s plate before the championship heads 500 miles south east to Semarang in Java the following weekend it will be an incredible achievement. It’s not just the Italian he’ll have to beat. There’s no shortage of riders lining up to steal points from him and next in line is Clement Desalle (Monster Energy Kawasaki). 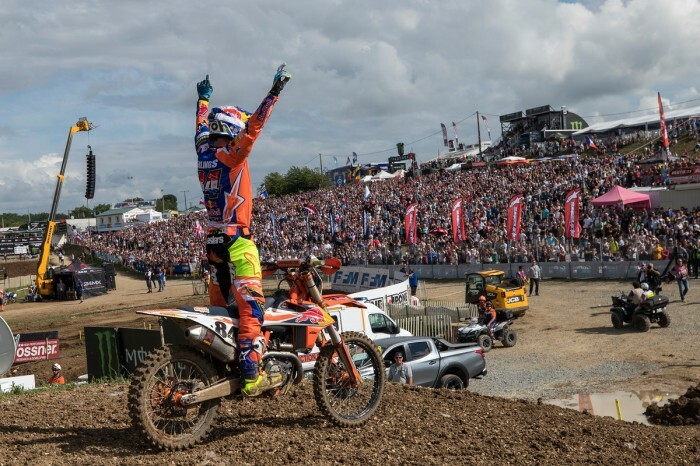 Realistically, the Belgian – along with everyone else for that matter – will need a disaster to befall the Red Bull KTM awning to have any chance of winning the title this year. He’s 100 points behind Cairoli with nine rounds to go and fourth-placed Romain Febvre (Monster Energy Yamaha) is a further 20 off the pace. Britain’s Max Anstie (Rockstar Energy Husqvarna) took his first podium of the season at round 11 and he’ll be desperate to keep that momentum going so he can end the season on a high – and with a decent deal for 2019 – but there’s another genuine British contender this weekend. Shaun Simpson (Wilvo Yamaha) took the overall in Pangkal Pinang last year. The Scot isn’t enjoying the best of seasons so far – a fractured hip in Russia certainly hasn’t helped – and, just like Anstie, he needs to get himself in the shop window as soon as possible. Sure, last year’s MXGP of Indonesia was a lottery – heavy rain made the track pretty much unraceable and it was cut to just one moto – but Simpson had the winning ticket and with downpours forecast for this weekend we could be in for more of the same. As always, Gautier Paulin (Rockstar Energy Husqvarna) and 2016 champion Tim Gajser (Team HRC) should be in the mix but out of the remainder of the top 10 only Jeremy Van Horebeek (Monster Energy Yamaha) has managed a moto podium this season. It’s a similar story in MX2 where defending champion Pauls Jonass (Red Bull KTM) and his team-mate Jorge Prado are miles clear of third-placed rider Thomas Kjer Olsen (Rockstar Energy Husqvarna) but the pair are a lot more evenly matched. Jonass kicked off the season with six straight race wins which put him 45 points clear of the Spanish teenager after three rounds but ever since then Prado has been chipping away at his lead and the Latvian is now only nine points ahead. So the best of the rest can only expect to fight for third place at the end of the season and after Olsen it’s British hope Ben Watson (Kemea Yamaha) who’s next in line. Currently 27 points down on the Dane, Watson has a 53-point buffer back to fifth-placed South African Calvin Vlaanderen (Team HRC) so he can afford to look forward rather than over his shoulder. Thomas Covington (Rockstar Energy Husqvarna) saw his championship dream turn into a nightmare in the first half of the season but the American, who will return home at the end of the year, is racing for bragging rights now and with nothing to lose – and proven race-winning speed – he’s the biggest threat to the leading pair.